How much do White Sox suites cost? Prices typically range from $3,500 -$6,000 for Chicago White Sox suites. Prices vary based on day of game, opponent, and the location of the suite in Guaranteed Rate Field. Luxury suite prices for concerts and other events at Guaranteed Rate Field can vary widely based on the type of event. Diamond luxury suites include HDTVs, theater-style seating and a climate-controlled environment. The luxury box will also come with VIP parking and in-suite catering options. The 2019 Chicago White Sox are making huge strides in becoming one of baseball’s best teams. The White Sox have built a young squad full of talent and it’s just a matter of time before everything gets pieced together. With a mixture of a solid farm system and strong veterans, the White Sox could win the AL Central in 2019. One of the biggest stories surrounding the White Sox is when prized prospect Eloy Jimenez gets his opportunity. Jimenez looks like a future star for years to come. The lineup is going to include Yoan Moncada, Jose Abreu, Tim Anderson and Daniel Palka. Two offseason signings that will be impactful this season include Jon Jay and Yonder Alonso. The pitching rotation is led by their ace, Carlos Rodon. Two exciting arms that can be at the top of this rotation are Reynaldo Lopez and Lucas Giolito. The White Sox have two great options at closer with Kelvin Herrera and Alex Colome in the bullpen. Guaranteed Rate Field will offer several suite experiences that fans can enjoy. On average, a White Sox suite will accommodate around 20 – 24 people. A suite for a White Sox game is going to be climate-controlled for your comfort and offer a wide range of premium in-suite catering options. The White Sox suite experience all starts with VIP parking passes and private entry into Guaranteed Rate Field. One of the biggest series this season taking place at Guaranteed Rate Field will be the cross-town rivalry, Cubs vs. White Sox. The Chicago White Sox will approach 2018 as a rebuilding year to showcase their highly touted young prospects. The White Sox were able to land impressive hauls for Chris Sale, Adam Eaton, and Jose Quintana last year, which has bolstered their farm system to one of the best in the MLB. Expect at least a few of the White Sox top prospects to debut in 2018. Manager Rick Renteria enters his second year with the club, hoping to improve upon last season’s 4th place finish in the American League Central Division. Slugger Jose Abreu is coming off a fantastic 2017 campaign in which he hit .304 with 33 home runs and 102 RBI’s. Yoan Moncada joins Abreu as one of the most exciting bats in the White Sox lineup. Moncada is one of the most talented young players in all of baseball, and he will look to build off of last year’s rookie campaign. In the outfield, Avisail Garcia will look to replicate last season’s All-Star performance. Carson Fulmer, Reynaldo Lopez, and Lucas Giolito will contribute to an extremely young and talented starting rotation. The White Sox have high expectations for all three starters heading into 2018, as they will be a huge part of Chicago’s rebuild. The South Siders will roll out impressive young talent all over the field in 2018. A White Sox luxury suite gives fans the ultimate VIP experience. White Sox suites at Guaranteed Rate Field can accommodate groups up to 22 and include VIP parking, comfortable theater-style seats and climate-controlled environment. A skybox for the White Sox is perfect for entertaining clients or relaxing with friends and family on the south side of Chicago. The White Sox enter 2017 have undergone major offseason changes. The White Sox traded ace pitcher Chris Sale to the Boston Red Sox receiving a handful of top prospects in return; most notably, Juan Moncada. Moncada has been compared to MVP second baseman Robinson Cano. Moncada is a generational talent who may see the major leagues in 2017. The Sox also traded right fielder, Adam Eaton, to Washington Nationals for more prospects. The White Sox will count on veteran's Jose Abreu and Todd Frazier to stabilize the team in a transitional time. The Cuban-born Abreu has been a sensation ever since defecting from Cuba in 2014. Abreu is the complete package, hitting for average, power and RBI's. Abreu has three consecutive seasons of driving in 100 runs. The starting rotation features three young starters and two veterans in James Shields and Derek Holland. Holland has proved to be a steady middle-of-the-roation arm for the better part of his career. In his sixth season, Jose Quintana offers the most upside of the White Sox Starters. 2017 will be the White Sox first season under the watch of Manager Rick Renteria. Renteria will replace last season's manager, Robin Ventura. Renteria faces a tough task ahead, but has plenty of prospects nearly ready to contribute in the Big League's. A White Sox luxury suite gives fans the ultimate VIP experience. White Sox suites at Guaranteed Rate Field can accommodate groups up to 22 and include VIP parking, comfortable theater-style seats and climate-controlled environment. A sky box for the White Sox is perfect for entertaining clients or relaxing with friends and family. After being named US Cellular Field for 13 years, the home of the Chicago White Sox was renamed to Guaranteed Rate Field on November 1, 2016. The Chicago White Sox are looking at 2016 to get back on track. Manager Robin Ventura saw his roster expand this offseason with much needed offensive help. The White Sox entered the offseason with a mission to improve upon the American League’s last ranked offense. They did just that by adding to power hitting infielders in Todd Frazier and Brett Lawrie. Frazier was last year’s Home Run Derby champion. Lawrie set career highs last year with the A’s in home runs and RBI. In Jose Abreu’s first two seasons, he’s hit over 30 homers and 100 RBI. With Frazier joining the lineup, it should help Abreu get better pitches to hit and even improve in his third year. Adam Eaton is a great leadoff man who also set career highs last year in runs scored and stolen bases. Melky Cabrera had a down year in 2015 but with more depth in this year’s lineup, Cabrera should get his hitting back the way it was in 2014. Pitcher Chris Sale led the American League with 274 strikeouts. Sale’s ERA wasn’t where he would like but with an improved offense he should see a boost in his win total. Jose Quintana will back Sale up. Carlos Rodon had an issue with walks last season but Rodon remains one of the more talented pitchers on this staff. David Robertson finished with 34 saves in his first year with the White Sox. Robertson is a quality closer who also as an elite strikeout rate. The White Sox are also excited to have a healthy Nate Jones setting up Robertson. A White Sox suite gives fans the ultimate VIP experience. White Sox suites at Guaranteed Rate Field can accommodate groups up to 22 and include VIP parking, comfortable theater-style seats and climate-controlled environment. A luxury box for the White Sox is perfect for entertaining clients or relaxing with friends and family. The Chicago White Sox improved significantly in the offseason and are ready to compete for the 2015 American League Central division. Jose Abreu is one of the best players in baseball. He was named 2014 Rookie of the Year after finishing the season with 36 home runs and over 100 RBIs. The White Sox traded for another ace in their pitching rotation, Jeff Samardzija. Samardzija will join Chris Sale to form one of the best duos in all of baseball. The team has solidified their closer position with the signing of David Robertson. The also added to their lineup by signing Adam LaRoche, Emilio Bonifacio and Melky Cabrera. Manager Robin Ventura will fill in the holes with his new additions but knows he has key players coming back such as Alexei Ramirez and Adam Eaton. It will be a tough task to take down the Detroit Tigers and Kansas City Royals in their division but with a mix of young talent and savvy veterans, there’s a lot of excitement brewing inside U.S. Cellular Field. Fans can watch the White Sox play from a Diamond Suite. White Sox suites at U.S. Cellular Field can accommodate groups up to 22 and include VIP parking, comfortable theater-style seats and climate-controlled environment. 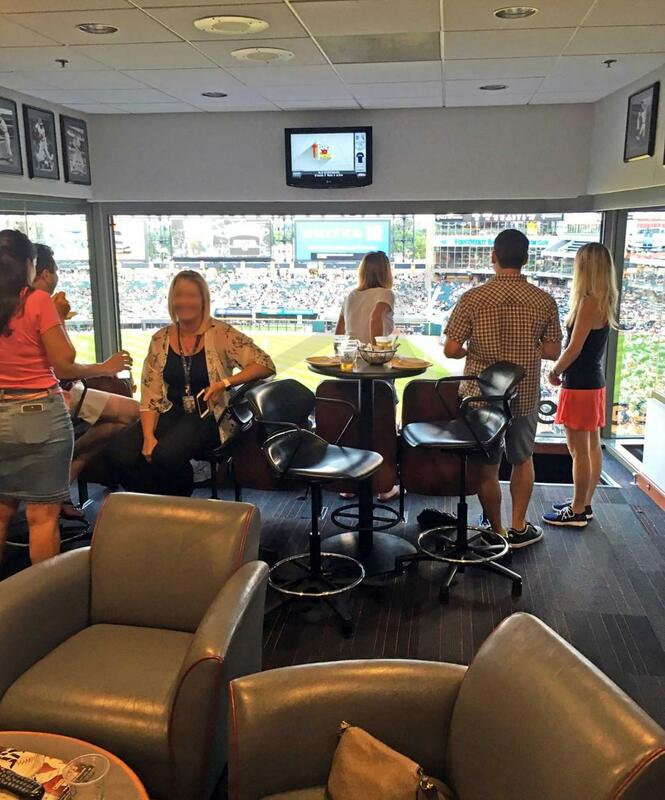 A White sox luxury box is perfect for entertaining clients or relaxing with friends and family. Thank you for signing up for specials at Guaranteed Rate Field. Enter your email address below to stay in touch. We'll sign you up for our newsletter, which will inform you of the latest inventory and events at Guaranteed Rate Field. We promise we will never sell or distribute your information. The seating chart below shows where the Chicago White Sox suites at Guaranteed Rate Field are located.